We’ve had so much fun watching our little man grow over the past few weeks. He had his first laugh at his dad on Sunday. Randy was dancing and singing to him then suddenly Jordan gave him a wide grin, which was caught on camera. I love to watch his little facial expressions. We’ve had fun adventures as a family over the past month. Jordan attended his first week at vacation bible school. 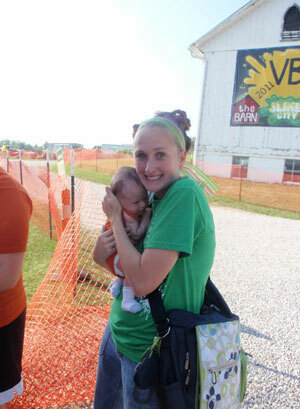 We were thankful to have my aunt here to go along to watch him in the air conditioned house, because our church’s vacation bible school is outside on a farm. We had over 700 kids attend. 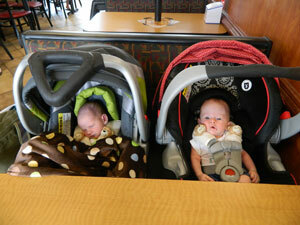 Jordan also attended his first “sleep date” with his friend Emerson. They are 3 weeks apart and it seems the times we meet one little guy is sleeping and the other is awake. We met at Chick Fil A then proceeded to Akron Children’s Hospital for a scrapbooking NICU support group. There have been some small typical bumps in the road. Jordan has encountered baby acne, slight fever from his shots, and a diaper rash from the antibiotics given after his urodynamics testing. His feet look a little better this past month. I’m not sure if that’s because I see them every day or as he grows they move a little more just from normal development. (He’s a little squirmer, let me tell you.) We will also be seeing Dr. Kerwyn Jones the orthopedic doctor. I’m hoping to hear a more firm diagnosis and plan for Jordan’s little feet. We also met with the health department nurse and Help me Grow. These agencies will help track Jordan’s development. We have an appointment next month with the Medina County Board of Developmental Disabilities to be assessed for his therapies. They will be in addition to his therapy appointments at the Myelo Clinic at Akron Children’s Hospital. I couldn’t be happier with our little man. We have been so blessed with such a sweet spirited baby. I love to sit and stare with a joy in my heart knowing that God has a great big plan for this little guy. He’s already used him in so many ways to touch people’s hearts and spread joy around the world. Continual prayers are important for him as he grows into what God wants him to be. Randy was able to get out and race for the first time since Jordan arrived on the scene. We were so proud to get the call saying he raced to 4th place. We had a surprise visit from cousin Jessica from Tennessee. Our time together was well spent. She went to garage sales with us. Garage sales have been Jordan’s main event. We’ve come across some great finds ranging, from a $15 swing that sells in the stores for $100 to books to add to our library.